This is an easy Mistake Finding Picture Puzzle. It contains the snapshot of Alternative Solitaire Card Game. However there is one simple mistake in this puzzle picture. Lets see if you can find this easy mistake? 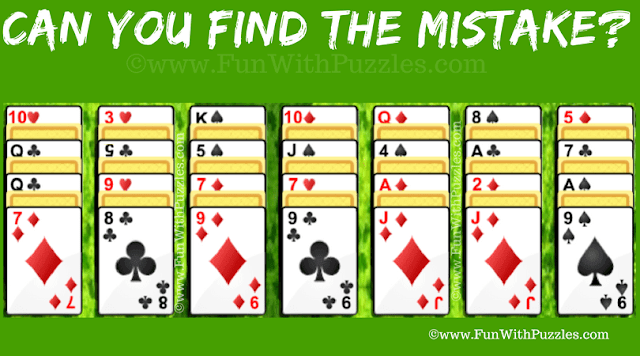 Answer of this "Mistake Finding Picture Puzzle", can be viewed by clicking on button. Please do give your best try before looking at the answer. To solve Alternation Solitaire Mistake Picture Puzzle you require little bit luck but more of your observational skills and little bit of Mathematical skills. Do checkout below listed Puzzle Games to test all of your these skills. 1. Maths Number Brain Teasers: These are the Maths Number Brain Teasers in which your challenge is to find the missing number in the Picture Puzzle. 2. Picture puzzles to find the hidden letters: These are the picture puzzles to test your observational skills in which your challenge is to find the hidden letters. 3. Interesting Quick Riddles with Answers to ask your friends: It contains funny but interesting quick riddles which you can ask your friends and surprise them later with the interesting answers of these riddles. 4. Awesome Missing Number Math Circle Puzzles with Answers: These are Maths Logic Picture Puzzles in which you have to find the value of the missing number in the Circle.